Yes. At least that’s my opinion, and of course my opinion is worth every penny you paid for it. Aging LDS Church President Thomas S. Monson has decreased his regular, day-to-day involvement in leadership meetings, a church spokesman said Tuesday of the 89-year-old Mormon prophet. Who Guides us in these Latter Days. But if he doesn’t come to the office, is he really guiding us? I mean the reports of dementia are well known. I even reported on it back in 2014. While the LDS Church won’t officially confirm or deny the rumors, it is a pretty open secret. If he were drunk, would we question his mental and leadership capacity? Monson being escorted back to his seat immediately following his address. He was assisted by Elder Uchtdorf and another man. 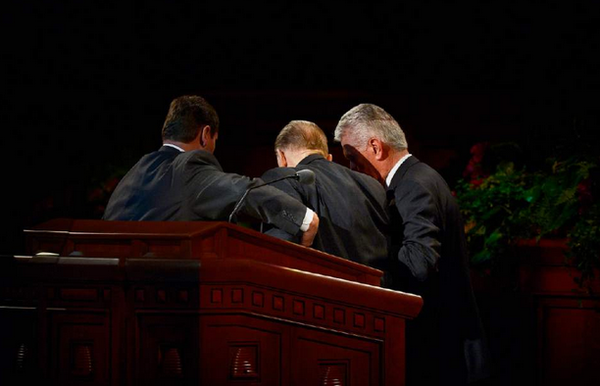 “Most of you probably did not see what was happening behind President Monson at the end of his talk. I was on the floor, just a few rows from the very front of the Conference Center with a clear view of the scene. You might have noticed that President Monson really struggled to finish the last couple minutes of his talk and especially the last 30 seconds. I was afraid for him. I thought he might faint, pass out, or something worse. If the church is to “go forth boldly, nobly, and independent” as Joseph Smith said his Standard of Truth, how can we say that a sick, brain-damaged old man (as nice and wonderful as he is) is leading the church boldly, nobly, and independently? Clearly Monson is so incapacitated that he isn’t even independent enough to go to the office any more. Did you see him last General Conference? He looked sick. He was hospitalized the day after General Conference. Let’s be honest. He’s not “guiding us in these latter days.” He’s drowning before our eyes. There’s a well-known story about a man who was trapped in his house by a flood. A man in a boat came by and asked if he wanted to be rescued. “No”, the man replied. “God will save me.” The waters rose, and the man ended up on the roof. A helicopter came by and asked if he wanted to be rescued. “No”, the man replied. “God will save me.” The waters soon covered his house, and the man drowned. President Monson. I love you. You’ve served the Lord well. But it’s time to retire, and convalesce in peace. You clearly have less strength and mental capacity than Pope Benedict did when he retired. Like the man surrounded by a flood, I think God is trying to tell you that you have served him well, but it’s time to move on and let someone with more capacity lead the church. Please retire (or give yourself emeritus status) and convalesce in peace. Once again, thank you President Monson. Thank you for your wonderful Christian example all these years. Set the example and retire when it is obvious you can no longer effectively serve. I think this is a sign from God. I agree with you MH. As one that has many struggles with the church and leaders, this is one where I wish for them to have the option to just say, “I have fought the good fight” and admit they just need to peacefully live out the remainder of their lives. They have earned it and I see no upside to remaining in their position without the facilities to fill their position. And the part of me that does have a bit of a problem in that NOT allowing a prophet (or an apostle) to just move to emeritus status is that it cheapens the role. If you don’t have to be competent and/or capable of basic communication, then what does it mean to be a prophet that can lead and guide us. It seems to me that he can’t. I wish the best for him and his family. I do take comfort in that they have acknowledged that he isn’t up for the task and that probably lifts a bit of the burden. I’m with MH and Happy Hubby. HH, your line about cheapening the the role really resonates. None of us, of course, can know how President Monson behaves or acts in private, but seeing someone that feeble (and clearly suffering from dementia and likely other health challenges) being trotted out to talk to the faithful makes me wonder a good deal about whether we’re as much of a cult as other folks claim we are. I think a lot of this is a direct result of leader worship and I can’t help but think that this is simply not a compassionate way to treat a man who’s clearly feeble and ill. What purpose does it serve to prop him up and have him give a short speech he can barely get through? IMHO, that’s an affront to his dignity rather than a sign of respect. I love President Monson and I loved his exuberance, enthusiasm and sense of humor, but he seems so tired and worn out. Let him rest and prepare for what I believe will be a glorious life on the other side of the veil. He’s truly earned a rest. President Nelson is next in line, according to the past approach. I haven’t sensed any eagerness on his part to move into President Monson’s office. As long as the work gets done, and I think it does, I’m satisfied with leaving well enough alone. Let’s not force anything onto President Nelson that he isn’t ready for. All of the Q12 >70 should be granted emeritus status, just like Hugh B. Brown recommended . In 1968 Hugh B. Brown was the one to propose that ALL general authorities become emeritus at a certain age, and had it been accepted he would have been one of the first to go emeritus. (see An Abundant Life: The Memoirs of Hugh B. Brown)…this idea was implemented ten years later, but did not include the First Presidency or Quorum of the 12. In 1979 the church Patriarch, Eldred Smith, went emeritus and that position in the Church (which Joseph F. Smith placed in higher authority than the Quorum of the 12) has remained vacant ever since. I think these brethren want a chance at the top position, are seeking for the top position. Otherwise, why wouldn’t they embrace Brown’s suggestion? I agree he should retire. We have seen this before with Benson and Kimball, where they no longer are in a position to function. Retire, please retire. Yes it’s way past time! Was he actually guiding us when he did go to the office? God really wants eighteen year old missionaries and eternal high end shopping malls? It seems Kirton McConkie is now filling the revelation and leadership vacuum. I work in Aged Care. For what it is worth here is my view. If Monson or any elderly person wants to continue to work and serve the community or organisations then they should be supported and sustained within thier capacity to do so. Aged persons have lots to offer. Thier minds are still sharp they are just slower than young people. They are less prone to irrational or risky decisions and often have great wisdom born out of life’s hard knocks. They tend to moderate the young a little!! I qualified my above statement with the word capacity. Obviously sicknenss, disease and general old age diminishes capacity. But the decision to continue should, as far as possible, rests with the person. Advice and the intervention of loved ones are sometimes required. But the dignity and independence of the person must be at the forefront of any decision. I am not sure that it is our place to call or demand a resignation of someone because of age. It is simply not our call to make. However to opine is certainly OK. In my opinion it would be unfair to suggest to Monson that he should continue as president of the church because of cultural influence or to satisfy the expectations of others. The fact that he has removed himself from demanding public engagements is probably very prudent. I hope it is commensurate with his current capacities and desires. Of course it’s our call to make. Should have stepped down a few years ago. Emeritus status for all Q15 at 85 or whenever they want to step down because of infirmities. “I am not sure that it is our place to call or demand a resignation of someone because of age. It is simply not our call to make.” (Dave-oz) In the RLDS/CofC, this has occurred but not for reasons of age/health. Joseph Smith 3rd. A portion of the membership called for his resignation over leadership direction, but it didn’t happen. Frederick M Smith. He submitted his resignation in 1925 for lack of support of his leadership, but the Conference rejected it. Israel A Smith . He left a letter designating his successor in 1952 and died in a car accident 6 years later. W. Wallace Smith. An actual revelation in 1976 named his successor with a 2-year period of preparation at which time he resigned and lived another 11 years. Wallace B Smith designated a successor outside of the Smith Family line in 1995 and resigned the following year. He’s still alive. W Grant McMurray resigned in 2004 citing “inappropriate choices”. The CofC Q12 chose the next president who is currently in office. So Israel A Smith is the only one who didn’t have a stigma of resignation during their tenure. I don’t think that the church membership would have an issue if he did as I have not seen any doctrine stating that it has to be “tell death do you part.” I assume it would be similar to that poll that asked active Mormons, “Do you think women should hold the priesthood?” and most (even women) said, “no”. The follow up question was, “If the prophet declared that women are now allowed to hold the priesthood, would you have an issue with that?” and the answer to that was also, “no”. It seems to me that most of the “he is the prophet until he dies” is a demonstration of faith and support – not holding fast to some critical doctrinal practice. I think the tradition of not resigning or going emeritus is rooted in the history of the LDS Church, particularly the succession crisis and Brigham Young’s ascension to power. There were a lot of people, after the death of Joseph Smith, who claimed leadership and a great deal of uncertainty. The Apostles claimed authority as a quorum, with the senior Apostle taking the lead. A few years later, Brigham was named President. Since that time, they have insisted on that pattern to avoid similar succession crises. I believe Brigham ordained one of his sons an Apostle and he would have had seniority over Joseph F. Smith, but the other Apostles said it didn’t count because he wasn’t in the Quorum of the Twelve Apostles. There is an advantage to having a very secure, fixed line of succession. It is basically impossible to game the system, so you avoid potential power fights. That’s probably smart in an organization where tens of billions of assets are held by one person. I suspect that the feeling is, there may be unintended consequences to changing things and instituting a retirement system, things have worked out okay so far (with the counselors basically taking over when the president is incapacitated), and they are not going to change things unless they are unanimous on it which is unlikely to happen. I am a fan of the Hugh B. Brown proposal, but I don’t ever see it happening. Because of the experience with GBH and SWK and ETB, I’ve not had a problem with Pres. Monsen’s condition or felt that he should step down. The temporal side of the church is well in hand with the Presiding Bishopric and the spiritual side seems to run fine with mid level bureaucrats producing position papers for the brethren to discuss. I doubt in any recent times there’s been an instance where a functioning prophet has had to step in and say “thus safety the Lord”. What I have been happy about is that there’s not been any effort to hide Res. Monson’s condition like there was with President. Benson. Steve Benson reported back in the day a photograph of his grandfather with him turned so as to hide the feeding tube in his nose. I agree the church would look better with a functioning president but I don’t think it would run any better or any differently. GBSmith – Your last statement to me really says, “Have A prophet on the earth isn’t that important and doesn’t make that much difference.” That leads me to either say we need to be that we “thank God for our prophetS” (faithful side of me) or that it isn’t that important to have a prophet or prophets (the more critical side of me). I agree with Happy Hubby. We would laugh to change the song to “We Thank Thee o God for our Bureaucrats.” A prophet should be unique. Otherwise, the special ability to be led by a prophet is mere words. We’re not led by a prophet, we’re led by bureaucrats. As to Benedict, nobody was asking for him to resign, and it caught everyone off guard, especially the cardinals. In fact, there were some Catholics that protested Benedict’s resignation, saying that only God should release him. Obviously Benedict was more healthy than Monson. Having gone through ailing prophets Kimball, Benson, Hunter, I’m not a fan of being led by a brain-damaged prophet. While these men were exceptional, what is the point? Hinckley noted that he was limited when he was the sole healthy counselor. That’s not leadership, that’s treading water. Maybe we should dump the song because we’re being led by a figurehead, not a real prophet. I tend to agree with MH on this. If we believe that the HG speaks to someone’s heart and mind, thy is not entirely possible when severe brain disease has taken hold. I work in law enforcement and have taken people’s drivers licenses off them when such conditions produce dangerous behaviour. Not sure that someone in a similar circumstance could run a worldwide church. When the leader is so incapacitated, it can open up the desire for those below to jostle for position. RMN and the furore around the Nov policy an the subsequent attempt at a cover up – in terms that involved Monson – was a good (albeit disgraceful) example of this. The questions I would like answers to are what is a “real” modern twenty-first century prophet, what does he do other than be the leading face of the church, and what is his role in the decision making processes given that all decisions by the first presidency and the twelve are always and I assume have to be unanimous. Even President. McKay was unable to do anything if Harold B. Lee or Mark E. Peterson were opposed. We use words like “prophet” like they were used during the time of JS and BY but it’s a different world and a different church. I personally don’t believe it’s any the less as a church but as I said, it’s just different. I also think it would do a lot to increase the credibility of the leadership if those over a certain age retired gracefully. What age did Hugh Brown recommend? Did he also recommend a method for choosing the Prophet. My father is 92, gave all his life to the church after he joined, Was a building supervisor (on a mission) for 10 years while I was a teenager, and then employed by the church. Was, along with a secretary, the whole of the church offices in Australia for another 10 years until someone from SLC came and asked what his qualifications were ( a carpenter), within 12 months he was replaced and asked to go back out supervising extensions of chapels. Within another 12 months there were 100 employees doing what dad and his secretary did. He retired at 65 and went on 2 more missions..
My wife and I went to general conference, and then the history centre and welfare square. Interestingly the history centre has a revised first vision at the end of which they show a 14 year old exhausted by the experience of receiving revelation. It would kill the older Apostles. I would like to see Uchtdorf installed immediately, not when he is too old to operate. http://zelophehadsdaughters.com/2015/10/11/predicting-who-will-be-church-president-updated-with-new-q15-members/ Note that any of the likely options under the present system will not be Prophet until they are in the high 80s. Had there been a candidate running in the Presidential election who was 87 say, how many votes do you think he would get? When church leaders were receiving revelation they were much younger, and also more likely to ask the Lord than rely on their certainty. GBSmith, you make a good point. Prior to President McKay, the church leader was called simply “President”, not “prophet.” Greg Prince notes in his McKay biography that McKay didn’t object to being called prophet (actually preferred it), and it has stuck ever since. Joseph Smith is the only prophet “like unto Moses.” Only Young, Woodruff, Joseph F Smith, and Kimball have had anything canonized. (Perhaps you could add Taylor with his unofficial revelation on polygamy that the FLDS think is legit) but all the other so-called prophets haven’t produced a single canonized revelation. If you’re going to claim the title of prophet, shouldn’t you produce at least one revelation? Or has the church gone into apostasy and God no longer talks to us? You can’t have it both ways. At a minimum, those individuals serving as prophet need to have an “advance directive” laying out what they want to happen when they become mentally or physically incapacitated to perform their duties. Even though SWK, ETB or GBH times seem so recent to most of us, I don’t assume that all will be well if TSM and everyone to follow just get added to the list as they become incapacitated. We are struggling in the internet age to have awe or even respect for anyone – prophets, politicians, teachers, and on down. Everyone is becoming more human and familiar, fairer game for discussion and criticism. It will be hard, especially for the young, to reverence the role of prophet when there seems to be no necessity or urgency to fill it with someone fully engaged. On the other hand, I think LDS people might tend toward more respect for the aged than other groups, because of succession process. To the question, “Is it time for Monson to retire,? the answer is, “yes,” of course. It is sad when that time comes. It was sad when my dad was forced to retire due to dementia. But it is sadder if he is propped up like a puppet or suffered some type of public injury or embarrassment due to his infirmities. There is an element in church culture which believes God will “remove” (through death) and relieve Pres.Monson of his duties when He deems it appropriate and necessary. But I believe God expects and relies on us to do the right thing–not just wait passively for Him to act. I would love to hear an ariculation of how exactly this changes if Pres. Monson is retired. I honestly don’t think it would be one bit of difference. I find it most interesting that the author proclaims love for Pres Monson but at the same time wants to kick his cane out from under him. 1). Pres Uchdorf’s example of standing ready to catch him is a better example of supporting and sustaining a prophet than what the author promotes. We should be willing to do the same as Pres Uchdorf. 2) President Kimball was MIA for years but the church carried on “boldly, nobly and independently” just fine with Pres Hinckley’s added help thrown in for Romney and Tanner too. Amazing how it all works out. 3) whether the Pope retires or not isn’t any of our never-mind. Different church, different belief system, different course, different leader, different everything. Our prophet will be removed when the time is right. I’m sure other things need to be in place first. It’s all a matter of timing be it world events, world leaders in or out of power, church situations… any number of things. I’ve learned a lot about timing since I’ve been a member. I wait upon the Lord to get all the cards stacked before he flips one over. 4) it isn’t us who decide that we have fought the good fight and will say we are done. Many have said it, true, and left the church altogether while still at young ages. Take the subject “death with dignity”. Christ didn’t die with dignity. He was hung up there naked for everyone to see. Who are we to say we need “dignity”? Are we better than Christ to call how we want to die and when? Same for saying we fought and served well. Christ didn’t die until he knew it was “finished”. We might think Monson is as good as finished but maybe there’s still something he personally needs to learn? Or someone in his family? Or in the church? Any number of other circles are watching. Some are praying for him. Others praying that he quit. Maybe this is judgment time to see where WE stand? With him in his position as prophet or against him? 5) We have 14 back up prophets. What’s the hurry / worry? Does this author just like kicking up dust? I’m concerned he might instill droplets of doubt in the new faith of our more recently baptized members who are without deep roots or experience. Thanks a lot buddy if you cause them to falter. End of opinionated rant. Thanks for the exercise. It was fun to think how I feel about the issue. I hope I can be as brave as my words if it comes down to my end and I’m suffering miserably in pain for seemingly ages. I hope to be brave and endure whatever comes. Here’s the problem: Because of his struggles with dementia, President Monson isn’t really in control any more-not only of the Church, but of himself as well. If he did want to resign, I don’t foresee any possible mechanism which he could use to do so. In other words, if he mentions wanting to retire, people will just dismiss it as the thought of a senile old man. It seems like a catch-22. I believe the Church has been established in such a way as to take into account aging Presidents. He’s the man who has been placed as the presiding officer of the Kingdom of God. The Church functioned fine when President Benson wad bowed down with age and dementia. If the Church was a one-man band, I could see him having to retire, or step down. But people love their prophet and they feel a need to sustain him if he falters. Church Presidents don’t retire. Theirs is a lifetime calling. We don’t live in such critical times that we need to brush these men aside. I’ve seen people suffering from dementia, and though they suffer confusion and loss of memory, they continue to understand love and respect. And when important decisions need to be made, they can be made by his counselors. John – After reading this, I just have to scratch my head and say, “So you are saying we don’t really have to have a (functioning) prophet?” I am not trying to be combative, but saying this in my mind just cheapens the role of a prophet. Your quote from Pres Lee even said it was a “tradition and custom”. Other that tradition I don’t see why we can’t give emeritus status to the prophet, just like “once a bishop, always a bishop, but not always actively serving in the calling.” Or is a prophet always a prophet even when they don’t act in that capacity? Are not the Q15 all “prophets, seers, and revelators”? Maybe for some this tradition brings comfort and a feeling of stability. I am just too much on the pragmatic side. I have always thought it to be terribly stupid to burn a flag just because it touched the ground. Sure – don’t let it get dirty. But one of the scouts in a court of honor once let a flag touch the carpeted chapel floor and some were saying we should burn the flag. I was the scoutmaster and protested that we were already strapped for cash (and not allowed to do more fundraisers per the CHI). A tidbit I have always found interesting: D&C 138 was revealed to Joseph F. Smith on Oct. 3, 1918. He died less than 50 days later, on November 19, 1918.